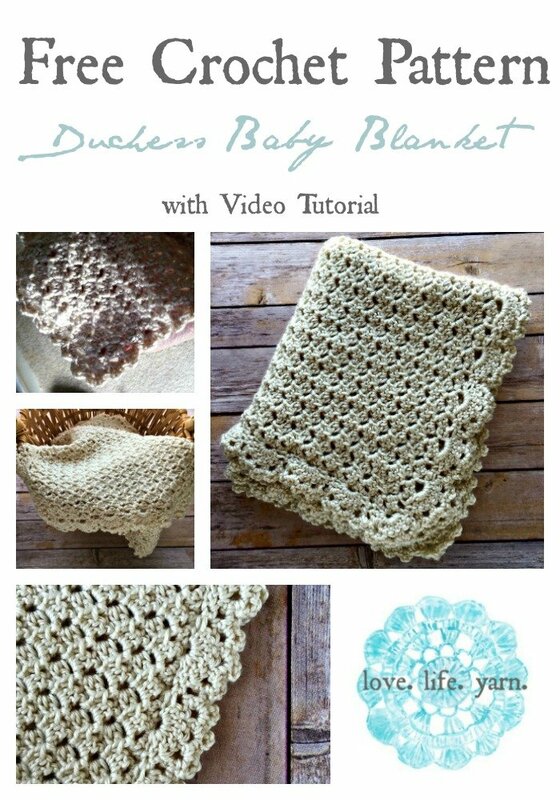 Duchess Baby Blanket - Free Crochet Pattern - love. life. yarn. My youngest son is really loving blankets and stuffed animals – something that my older two boys never did. I really think he is going to be my animal lover because of how excited he gets whenever he sees animals. He will find a blanket or lovie and just squeal with delight and cuddle with it. That’s what he did when I gave him this blanket to model. This blanket was intended as a gift for a friend having a girl but I think my little guy has claimed it as his own, just like this other blanket I created. Looks like I’ll be making more blankets and stuffed animals in my future!! Row 43: Ch 1, *2 sc in ch-3 sp, dc in 2nd dc; repeat from * to last ch-3 sp, 2 sc in ch-3 sp, dc in top of turning ch; turn. Round 1: Ch 3, 2 dc in same st, *sk 2 sc, sc in dc, sk 2 sc, 7 dc in next dc; repeat from * to corner, sc in last dc before corner, 7 dc in corner st, [*(sc in next ch-3 sp, 7 dc in next ch-3 sp); repeat from * to last ch-3 sp, sc in last ch-3 sp, 7 dc in corner st] across side and bottom, repeat from * across other side to last ch-3 sp, sc in last ch-3 sp, 4 dc in same st as beginning; join with sl st to top of ch-3. Round 2: Ch 1, sc in top of ch-3, ch 3, sk dc, sc in next dc, *ch 3, sk sc, sc in dc, (ch 3, sk dc, sc in next dc) three times; repeat from * to last dc, ch 3, join with sl st to beginning. Round 3: Ch 1, (sc, ch 3, sc) in next ch-3 sp, (sc, ch 3, sc) in each three ch-3 space, join to first sc with slip st. I tried just using the same pattern stitch for the border which worked well but I was going for a lacier look. If you would like a simple one round border, work pattern to row 42, then work row 2 of pattern along sides, and bottom, leaving the top as is. To turn the corners, simply work (2 dc, ch 3, sl st) into corner ch-3 space. If you like the look of the photo below then follow the original border instructions. I have added a stitch diagram you can view here. Thank you for this pattern! He’s beautiful! Looks like you! If I wanted to make this bigger. What is the multiple for stitches? Thank you! Now I don’t have to ask! I like to have this info when I write out patterns. I use a steno sized note book. I find it easier to follow than a print out. I print larger. Love this so pretty, thank for sharing. Thank you so much Ruth!! He is our third boy and our little guys really favor each other. Our oldest is over 6 now and I can’t believe how much he has grown. I’m so glad you like the pattern. Congrats on the great grandbabies!! Is the pattern in US or UK terms please? I love you baby. He looks like such fun. how could you not give him this blanket? Thank you for the pattern. Aww thanks Carolyn. 🙂 He is definitely a fun little guy! The blanket is all his – as is the next one I designed (you can see him with it here!). I’m so glad you like the pattern. I tried to print your pattern a few times but the left side of the print is cut off. What am I doing wrong? Thank you. I got the pattern and can’t wait to work it. Sp stands for space. When you chain 3 there will be a noticeable space there that is referred to as the ch-3 sp. This abbreviation is often used in crochet any time you chain and leave an open space in your work. Hope that clears it up. 🙂 Let me know if you have any other questions! I am currently making this blanket for a friend who is expecting a wee little one in August. I love this stitch and pattern!! The blanket has lovely drape yet has a spongy, squishy feel, pillow like. Thank you so much for offering it for free!! I appreciate your had work and creativity!! Yay! I’m so glad you like it. 🙂 I had a really great time making this blanket and love the Duchess Lace stitch, too! Beautiful. I must try it. I have a great niece on the way. This will be the perfect baby shower gift. Thanks for posting. Beautiful blanket!! But I would like the option of making bigger/smaller. This looks like a great blanket! I can’t wait to start making it! The link for the yarn no longer works so…. How many yards of yarn is needed for this blanket, please? I have a coworker who is in the hospital as her symbiotic fluid started leaking at five months pregnant. I thought I’d make her one or two of this blanket while we all wait. Thank you very much for the beautiful pattern, fell in love with it and completed one just yesterday. Only regret is us Japanese are so used to diagrams here in Japan that I was unable to decipher the “lacier border” instructions so went with the simpler border. Just wondering if it’s a diagram you would be posting later on when you say “chart of the border”? Thank you. Awwww, that is just perfect, thank you SO much! Have a nice summer, and best to your lovely family. That would be great. I like a diagram just to make sure I’m on the right track. I will get it up on the site soon! I love this pattern!!! So beautiful & reminds me of a rustic/antique blanket! I do have a question, on rows 2-42 are the edges suppose to go in at an angle? Where is says “ending with dc in top of turning ch; turn.” You end with just the 2 dc & not the ch 3, slst, right? Hi Amanda ! The blanket is beautiful and so is your son ! I just printed your pattern and was wondering how many yards this blanket takes so vintage and want to make one for a gift. I must say you have great talent. I appreciate your help and the thank you! I loved this pattern!! I used I love this yarn sport weight from hobby lobby. I’m pretty sure I goofed somewhere because my edges are like a zig zag! I’m working on the first row of the border. When you get to the bottom, do you work into the starting chain? Love the pattern! Thank you for sharing!!! I’m working on the border, question on row 1 is one side gonna be different then the other three? I’m working the first side of row one so when I get to corner I start the second part of first row? And continue for the remaining 3 sides right? Hope my question makes sense! Thank you!!! Hi Stacey! The sides should all be the same pattern but you will work fewer repeats on the shorter sides. You should have 7 dc in each corner space, then work the repeat pattern. Let me know how it works out! I emailed you last night. Let me know if you didn’t get it! Looking forward to making the blanket, as I just found out 2 ladies that do foot care for me are pregnant, one in March, the other in April. so I decided to make a blanket for each of them. Love, love, LOVE this! I have two questions for you… 1. Do you know the name of he specific stitch you used and 2. If I wanted to alter the size of the blanket what multiples do I need to use to keep the pattern accurate? Thank you SO much for this beautiful idea!! Hi! You can check out an awesome tutorial of the Duchess Lace Stitch here. Let me know if you have any other questions. Beautiful pattern, beautiful, sweet baby! Sadly, this Red Heart Yarn is splitting like crazy. I will have to try a different yarn. Is anyone else having a problem with the yarn splitting? Hi Zora! There is an excellent video for this stitch here: Duchess Lace Stitch. This blanket is gorgeous, thank you so much, I’m making it for my best friend who is due her 7th in December. Hi Becky! Welcome to the crochet world 🙂 It’s really addictive! The weight of this yarn in the US is a 4 or worsted weight, which I believe is DK in the UK. I’d love to see pictures and you can always add your project to ravelry, too, where I can see it. 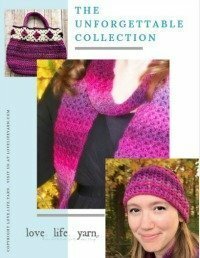 I love checking out what other knitters and crocheters make with my patterns! Let me know if you have any questions! I have to agree with you when you say it’s addictive, I’m totally addicted to the point where I’m blitzing all my household chores just to be able to sit and Crochet 😂😂 and being a first time grandma to identical twin girls born 6 weeks ago, I’ve plenty of ideas to keep me busy! Thank you for a fab website and for sharing . I’ll be sure to add some pictures of my finished results. Could you advise me what the * means in the pattern. I am eager to begin but am un sure as it’s only my second crotchet project. Hi! I love your blanket! Will the border work out the same if I do more than 43 rows? I’m not sure why, but my blanket is looking more like a scarf, deminsion wise, and I’m already on row 35. I am new to crochet and I just made this blanket! Thanks for sharing and especially for tutorials- even for lefties! P.S. Enjoy those precious little boys! My boys are a handful but I’m trying to savor this time as it flies by. is the longest edge, I’m assuming this blanket is worked “sideways”…I want to make mine more of a crib size …so, I wanted to double-check before I start!! Hi, I have a question about the lacy border. Normally, you skip the 2 sc then either do 1 sc or 7 dc in the next one, but on the starting ch side, I’m not really sure how to do that side because it’s a little different and it doesn’t seem to work out to the same number of shells as the opposite side. because the foundation chain was all over the place and knew I needed to begin again. I can’t wait to start that over. Thank YOU!! if you could put a photo up of the blanket spread out with no border so that I know I am on the right track. So to be clear — when you make your ending 3 chain the the first stitch is actually the 3rd? 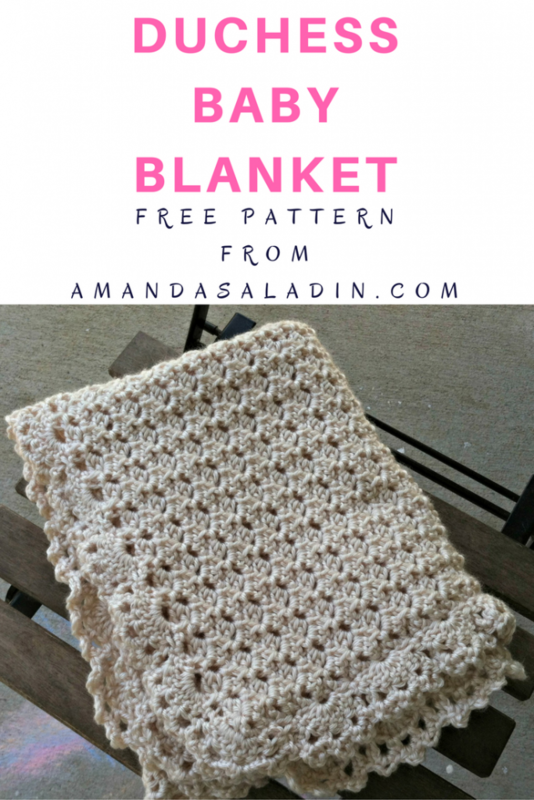 I am hooked on crochet — and despite some frustrations — bound and determined to conquer this!! Hi Mary! I’m so glad you like the blanket! This foundation chain has always worked the best for me and it’s what I always use. I know some people can’t stand crocheting into the back of the chain but I say whatever works for you is the best way! I can just more easily see the stitches that way, especially when I was new to crocheting. It takes a little while to really “see” the stitches and everything, but you will get there!! So glad you started this wonderful hobby and I can’t wait to hear how this turns out. Let me know if you have any other questions! Thanks so much for your response! I am on the right track — using placemarkers is working really well. It is nice to know I am on the right track. If I am using the same yarn could you tell me how many chains I would need to make a 41 x 42 blanket that includes the pretty lacey border? Also fairly new to crochet…I am currently on the border middle row on the second turn…the stitching that it’s attaching to is different and I’m having trouble..the shells do not look even..some look bunched and some are spread farther apart..this is my third try..
Hi Wendy, I’m not sure why you’re having trouble with the shells. If it isn’t working with the stitch pattern of the blanket try using the size of the shells themselves to guide you. When you are on the last dc of the shell lay it down by the last row and see where it looks like it won’t bunch up or spread out – even if it’s not exactly where it “should” go – and attach it there. I hope that makes sense – let me know how it goes! I recently made the dutchess blanket in off white for my granddaughters Christening . It turned out great but I needed to go with the simple border because when I started row 43 there was no chain 3 space to do 2 sc in from row before. I was at the end where a dc had been made in top of turning chain after turning. I really loved the Lacey border and that was why I selected the “dutchess blanket with Lacey border”. I am doing another blanket for a friend and need to do it correctly from the start. The blanket looked beautiful and just like yours but I got to 24 x 36 way before 42 rows. Calling it row 43 as it represents last row. have been possible. Many thanks and Happy new Year to you and your family. Roma – thank you so much for the kind words!! Inspiring others to create is one of the main reasons I do what I do. 🙂 Your comment made my day! Looking forward to sharing new patterns with you this year. Hi, this will be my first ever crochet. Love the look of the blanket. Please could you send me what the abbreviations mean? Thank you so much. Happy new year. Thank you so much. I have done 15 lines, but I don’t understand why it’s getting smaller! I looked several times and think I’m doing the right thing. I do the double chain in the last space, then turn and do 3 chain, then start the row with double chain. I know I’m doing something wrong.. please tell me how can I fix this, and what am I doing wrong?